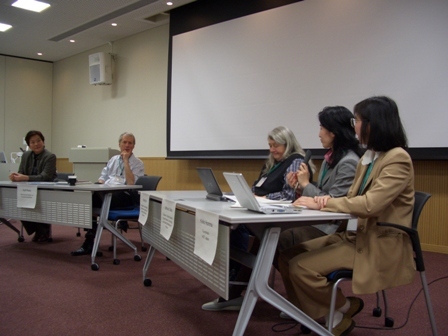 The panel discussion "Women in Robotics, Human Science and Society" was held on March 8th during the 9th International Conference on Intelligent Autonomous Systems (IAS-9) in Kashiwa Campus, the University of Tokyo, Japan. Approximately 30 participants - researchers, students and journalists attended this panel discussion. We would like to thank to all the participants. As an opening speaker, Dr. Keiko Honma (AIST) - the coordinator of the panel discussion introduced all the panelists: Prof. Mihoko Otake (Univ. 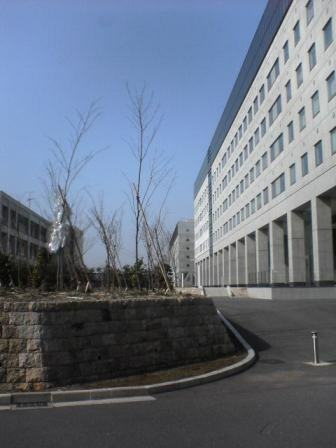 of Tokyo), Prof. Maria Gini (Univ. of Minnesota), Prof. Rolf Pfeifer (Univ. of Zurich) and Prof. Hisako Ohtsubo (Univ. of Tokyo). 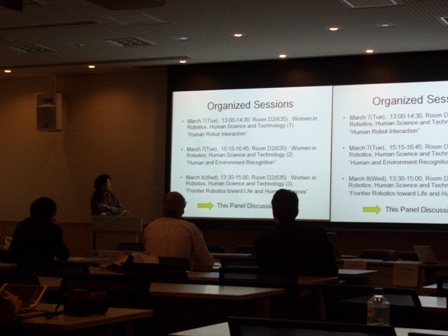 As the first speaker, Prof. Mihoko Otake - the organizer of the Women in Robotics Community gave a presentation entitled "Women in Robotics towards Human Science, Technology and Society: Motivation and Practice" [Abstract]. First, she reported that 12 out of 150 total participants in IAS-9 were women participants. The proportion of women participants, 8%, was the remarkable statistical figure. The figure is higher than the proportion of women in the Robotics Society of Japan - approximately 2%. 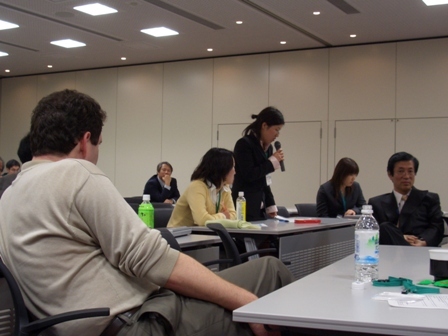 Then, she introduced an organized session "Women in Robotics, Human Science and Technology" on March 7th and 8th. This organized session was the first trial that all the speakers were women and aimed at sharing knowledge and networking among women researchers in the world. 9 out of those 12 women participants in IAS-9 gave their own talks in the organized session. Finally, she addressed the purpose of the community, "Our purpose is not to elect a fence between men and women, but rather to facilitate collaboration among researchers and students across field, generations and countries - especially in terms of women." The second talk was given by Prof. Maria Gini entitled "Strategies to Increase Women Participation in Computing: The University of Minnesota Experience." In her talk, she introduced four activities, which aims at promotion of participation in the field of engineering for minorities such as women and Native Americans, at the Dept. of Computer Science and Engineering, the University of Minnesota [Abstract]. (a) The first activity is a summer school program for elementary and junior high students. The students can learn implementation of AIBO behaviors (e.g. dance), robot assembling and programming with palm pilot robot kits, and making a presentation with these results. (b) The second activity is a summer school program for female high school students in order to overview of the field of engineering for one week. Especially, one of these days is programmed for robotics: the students can attend an international conference and, moreover, have lunch with researchers so that the students ask questions to experts directly. Furthermore, the students can experience virtual reality applications and implement AIBO behaviors at research laboratories. (c) The third activity is lectures and seminars on robotics for female undergraduate students at the university. 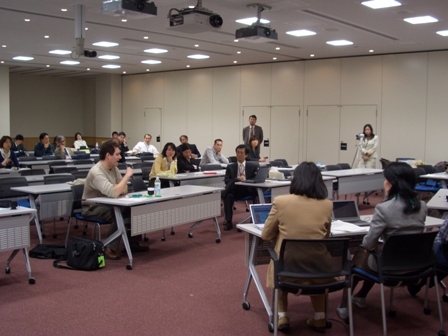 For example, the programming course, which offers implementation of AIBO behaviors, is the representative seminar. Especially for beginners, "pair programming" teaching style, in which two students cooperate to implement one program, is applied. The style provides more opportunities for communication among students. (d) The fourth activity is awards and grants for female graduate students and women faculties. Lunch meeting, game party, and workshop are conducted as general activities. The third speaker—Prof. 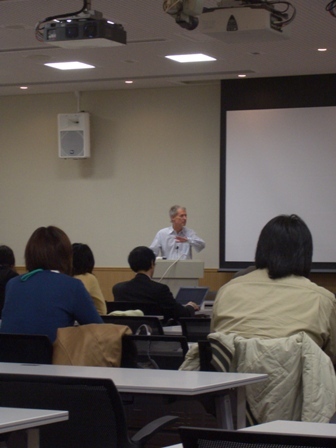 Rolf Pfeifer gave presented engineering education for for female students in Europe, entitled "Girls Discover Robots -- a European Perspective" [Abstract]. In the beginning of his talk, he mentioned that occupations in science and technology tend to be unpopular in Europe as well as in Japan, because in these professions, they have lower prestige and salaries than bankers, stock officers, and consultants. Especially, the percentage of female students in the field of engineering is small - approximately 20% (e.g. the percentage of the ones in Japan is 10.6 % in 2004). Therefore, collaboration of different fields such as engineering and art is on going for the purpose of attracting female students. Referring to such circumstances in Europe, he insisted that not only female students but also students in general should be recruited to the field of science and technology and be educated to become good researchers and engineers. As one of the representative activities, he mentioned the "Roberta" project, which is coordinated by the AIS laboratory at Fraunhofer in Germany. This project is a robot education program for 12 to 15 year-old students, which uses LEGO Mindstorm as a material. The main purpose is to attract young female students in the field of science and engineering. Therefore, the program is well designed for female students. However, this program is not restricted to female so that male students can also attend. This project has been expanding to several European countries. 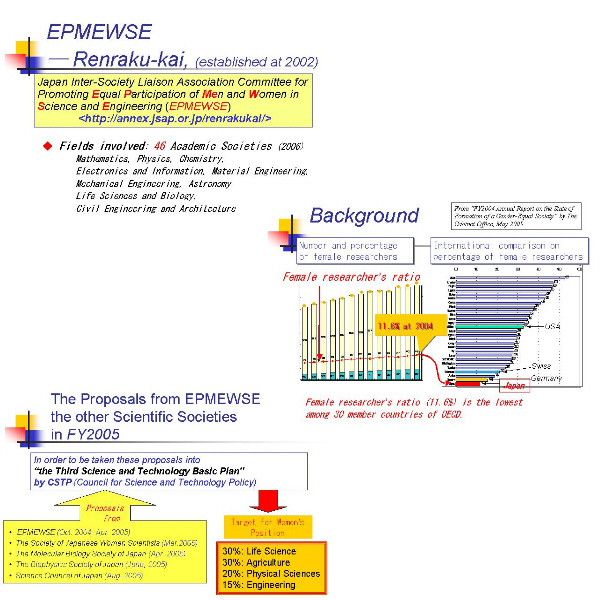 The final talk entitled "Promoting Gender Equality in the Field of Science and Technology in Japan" was given by Prof. Hisako Ohtsubo, who is a secretary of the Japan Inter-Society Liaison Association Committee for Promoting Equal Participation of Men and Women in Science and Engineering (EPMEWSE) (Japanese HP). 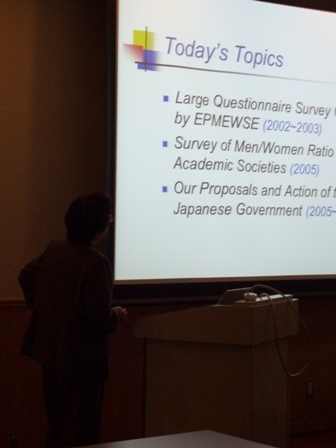 She reported the results of survey, which was conducted by EPMEWSE, and present status of gender equality in science and engineering [Abstract]. The survey by EPMEWSE indicated that men and women in research did not have any differences on their awareness of career development in general. However, some remarkable gender gaps were seen in the results: the first gap was the average number of children in the lifetime. Men had approximately two children. Meanwhile, women had one child. It seems that women researchers have difficulties on bearing and raising children at present work circumstances; the second gap was working conditions such as job status, the number of subordinates, and research funds. It indicates that it is necessary for women researchers to establish support system for career development during and after child-care leave. Then, she introduced that Japanese government established the fellowship of JSPS as one of such support systems in 2006, for the purpose of helping researchers on child-care leave to return to their career in research, smoothly. She also showed some EPMEWSE activities to society. For example, she mentioned the proposal to "the Third Basic Plan on Science and Technology," which was written by the Council for Science and Technology Policy (CSTP) and the numerical targets for recruitment and promotion of women researchers in career as the results of the proposal. After all the presentations, discussion on women in robotics, human science and society has begun. 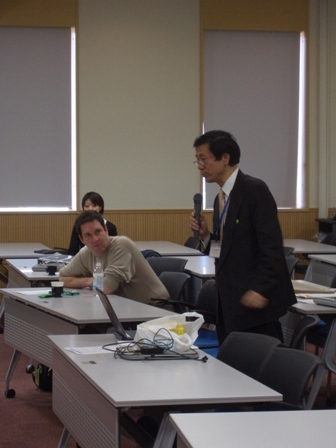 Firstly, Prof. Arai - the general chair of IAS-9 started to ask, "Are there any needs for robots to help raising kids?" because Dr. Ohtsubo mentioned an important issue on difficulties of raising children for women researchers. Especially, she indicated the increasing number of women researchers at present, and then the issue becomes more serious in the future. Prof. Arai also mentioned, "If robots can care children and it is only a few minutes, it would be helpful for women. And also, is it an interesting research topic for women researchers, isn't it?" In reply to the comment, Dr. Homma, who was the coordinator of the discussion, introduced some works in the field of assistive technology, and moreover, Prof. Ohstubo mentioned that some kindergartens install monitoring camera system so that parents can observe their children through their mobile phone all the time. Prof. Pfeifer suggested more outreach activities should be necessary to all sorts of generations. Prof. Ohtsubo introduced the summer school for women students of junior high school and high school, and she also suggested all the participants to join the summer school to offer robotics courses. Then, the participant who majors in nonlinear dynamics, said, "In order to increase the number of women researchers in the field, we have better make an attractor, which circulates positive feedback. For example, if the role model of women researcher as Madame Curie appears in the field of robotics, the symbol would attract lot of women, and then more women would come to the field". Prof. Arai responded "You should become the ones!" Then, a burst of laughter sounded in the discussion room, while we promised ourselves in our minds. The arising issues during this panel discussion are not only the matters of women. They should be discussed with both genders. Therefore, we appreciated that Prof. Rolf Pfeifer attended as a male speaker in this panel discussion. One other participant questioned "Are you going to provide activities for both men and women?" As the policy of this community, our activities are not restricted to women so that more participates are welcome. In summary, the first activity of our community - the panel discussion "Women in Robotics, Human Science and Society" finished successfully. Furthermore, it is gratifying that the survey on the discussion indicted most participants are satisfied. We would like to thank all the participants of this panel discussion. Most participants expect this community to provide opportunities for an exchange of opinions. Therefore, our community is running this website for sharing knowledge and discussion (URL: http://women.ws100h.net/). We would like to contribute to attract young female students to the field of science and technology and to help female students selecting engineering careers. We are looking forward to your participation. 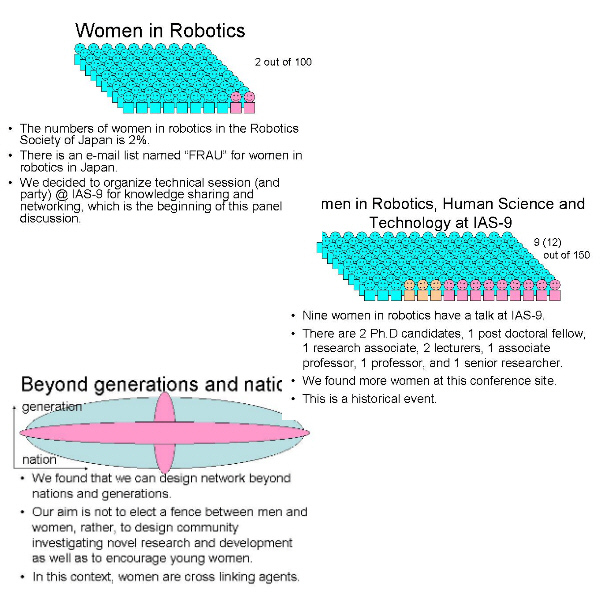 Panel Discussion "Women in Robotics, Human Science and Society"